Is your current electrical service panel defective? Do you have an older Federal Pacific or Zinsco electrical service panel? Do you require a new service panel installation for a new home or addition? Spectrum Electric can help. Spectrum Electric, Inc. has been replacing electrical service panels for over 10 years, and our owner’s own professional electrical experience spans over 35 years. As a top electrical company in Orlando, we want to make sure our customers are getting the best possible service at all times. Our electrical service panel installation or replacement service will ensure you receive the best materials available and that your home is safe from electrical fires. 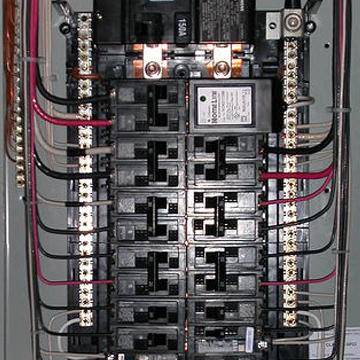 We use the same service panels and breakers in your home that we use in our own. Our relationships with our trusted manufacturers and suppliers ensure you get the best possible price. Our experience and reputation ensures the job is done perfectly. That’s where we stand as your trusted power service in Orlando. Should we determine that service not included in the above is required to complete the upgrade, such as replacing any portion of the home’s electrical wiring, or we’ll give you 10% off labor charges when you hire us to fix anything we find. It’s another way we say “thank you” for choosing us for all your electrical needs.